Our Old World Classic floors are the result of nature and man working together to create a unique masterpiece for your home. These original, hand distressed floors have been designed for the customer that desires the beauty of a reclaimed floor from the past in a new, wood product. The look of a custom or reclaimed floor is not intended to appear like a new floor, rather, resemble one that has seen many years of use. Each Hardwood Galleria distressed floor has its own character, grain, knots, mineral marks, and distinctive features making it a unique piece of wood. Our custom designed floors are a natural and hand crafted product, guaranteed to add character and beauty to your home. We offer a range of custom floor choices in a variety of stains, colors, sheens and levels of distress. Our floor designers can work with you to design the custom floor of your dreams. We are proud of the craftsmanship and quality that goes into our floors. Our custom floors can adapt to a wide range of applications and lifestyles. Our distinctive designs offer unlimited possibilities to help you create your dream floor, with unique and beautifully crafted custom wood floors. 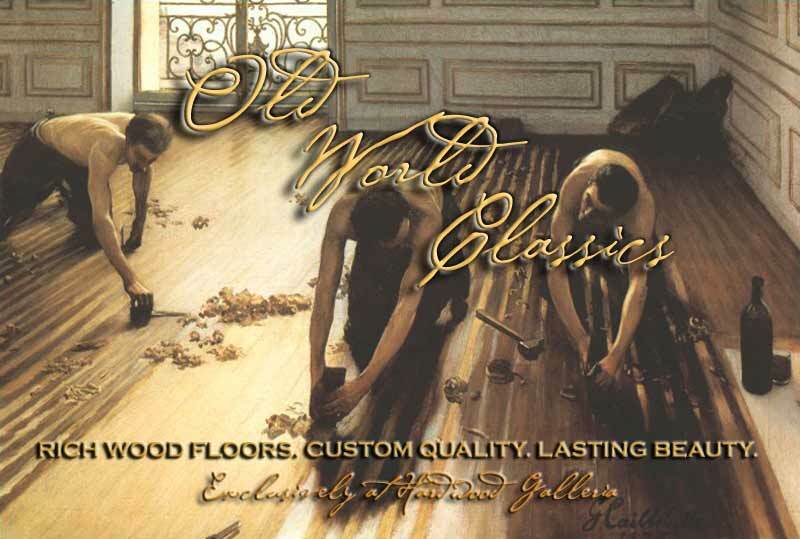 ©2004-2011 Old World Classics Exclusively at Hardwood Floor & Tile Galleria All Rights Reserved.